Brass Wire Mesh - Buy Brass Wire Mesh Product on Anping Kingdelong Wiremesh Co.,Ltd. Brass wire mesh is also named brass wire cloth that offers excellent electrical and thermal conductivity.It's an ideal mesh for fabricating gasoline filters and baskets for electropolishing. It possesses greater strength than copper or bronze. Applications include electronic security, aviation, outer space exploration and research, power generation, electronic information security, high-frequency scientific and medical equipment. Brass wire, such as 65 brass (the brass proportion is 65%, the zinc proportion is 35% ) and 80 brass (the brass proportionis 80%, the zinc proportion is 20%). 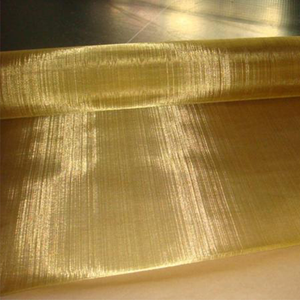 Brass wire mesh has the properties of acid resistance, good alkali resistance, wear resistance, strong tensile strength, better permeability, stable structure and long service life. It is non-magnetic, anti-sparking and is resistant to atmospheric corrosion, salt air and brine. Meantime brass wire mesh also has better abrasion resistance and lower electrical conductivity. Application: sieving many kinds of grain, powder, porcelain clayy, porcelain printing, and filtering liquid,gas and so on.